Since my last post, I have finished my pediatrics rotation and completed an emergency medicine elective. I know I haven’t written too much about peds, but I had a great time on the block chiefly because a) no one yelled at me for six entire weeks, which is a clinical year record, and b) kids get better, as I mentioned before in It’s Always Turner Syndrome. I must reiterate that despite this excellent experience, I cannot be a pediatrician. It’s not the patients, or the diseases, or even the parents – it’s the other pediatricians. Everyone is much too happy and peppy for a curmudgeonly, 27-year-old version of Gran Torino-version Clint Eastwood. 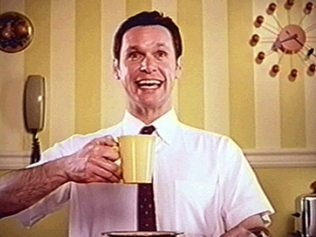 It is some kind of requirement that everyone on peds walks around all day looking like Enzyte Bob from natural male enhancement commercials. I am not Enzyte Bob. I am at best a mediocre rank on the happiness spectrum who happens to possess a remarkably crude sense of humor and a bitingly sarcastic wit. This, understandably, does not go over so well with people who derive their principal daily joy from handing out stickers of Dora the Explorer. Don’t take this as criticism of pediatricians – I loved them, and I loved peds. Seriously. I wish I were nice enough to pull it off as a career, but if we’re being honest someone would accidentally sprinkle ricin on my lunch by the end of my intern year. One other last thing about peds before talking about emergency medicine. Now that I’ve completed both OBGYN and pediatrics, I can say that babies are awesome except 1) when they first come out as terrifying, mucus-borne Alien monsters, and 2) when they project bodily fluids onto you. All kinds of bodily fluids. Enough said. At the end of pediatrics we get a chance to do a 2 week elective in anything we can get into, and mine was emergency medicine. We had a few shifts in the emergency department, but almost every morning started with a lecture from one of the national legends in EM. At the start I intuitively feared this man in the same way that most people intuitively fear bears. By the end, he was my favorite lecturer of the year. In the EM department’s conference room, there’s a poster of this guy in Barack Obama-style stenciling with the caption GIDDYUP. So yeah, it’s his thing. One student volunteered there were more than five causes of altered mental status. He has not been seen since. At the end of the epinephrine talk, he asked us to go with him to see what an ampoule of epinephrine actually looked like. We went out onto the floor as he called a nurse over to open the medication cart. I looked at Giddyup. He looked back at me, vague disapproval at my lack of initiative flickering across his face. I am usually okay with disapproval but I kind of want this man to like me, since I might end up working in his ER one day. “Pull out the 1:1000 epi, please,” I said tentatively. He pulls out the wrong one, evidently on purpose. “This one?” he says. “No, that’s the cardiac epi, we need the 1:1000 kind.” The nurse, who was obviously playing along for Giddyup’s benefit, pulled out the correct one. “What’s the dose?” he asked me again. Out of the corner of my eye I saw motion. I look over to see our lecturer making a rhythmic motion that can only be described as “mimicking riding a mechanical bull” with a huge grin on his face. I looked back at him, confused. This went on for a few seconds (you can imagine how awkward it is to make prolonged eye contact with someone who, for no good reason, is pretending to ride Secretariat). I want to be the slightly mad ED doc in the future. Hey! I love your blog; it has been a brilliant source of information! I aspire to do medicine after my degree! Did you ever worry you weren’t smart enough? I feel quite doubtful of my abilities because the stereotype is that doctors are like geniuses ! Yes and honestly I think every single day that I’m not smart enough! I think you end up realizing at some point that you are always going to have days where you think you can’t handle it or that everyone else is smarter than you. maybe that’s most days, like me. But you learn to trust the process to get you where you need to go, and realize that if you can get in that means someone who is most probably actually smarter than you thinks you can handle the load. Best of luck and thanks for reading! Very good point! Thank so much! All the best with your studies!